Caring For Aging Relative: 'To Give Her A Good Life' The finances, logistics and emotions involved in caring for an elderly family member can be overwhelming. But three caregivers in multigenerational households see little choice. "She did her best for me, and I want to do the best for her," Geneva Hunter says of her 89-year-old mother, Ida. 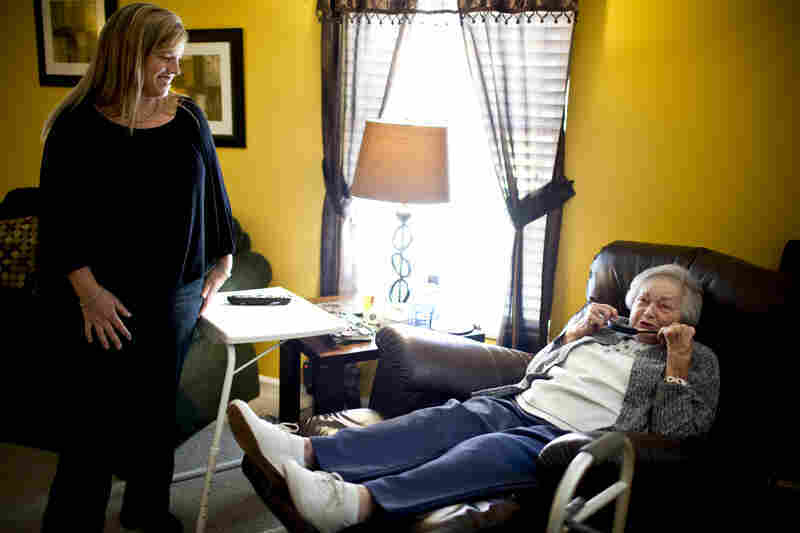 Geneva Hunter (left), who runs the secretarial operations for a Washington, D.C., law firm, decided to take a hands-on approach to her mother's care and moved Ida Christian, 89, into her home in Odenton, Md. Ida, who has dementia, needs around-the-clock care. 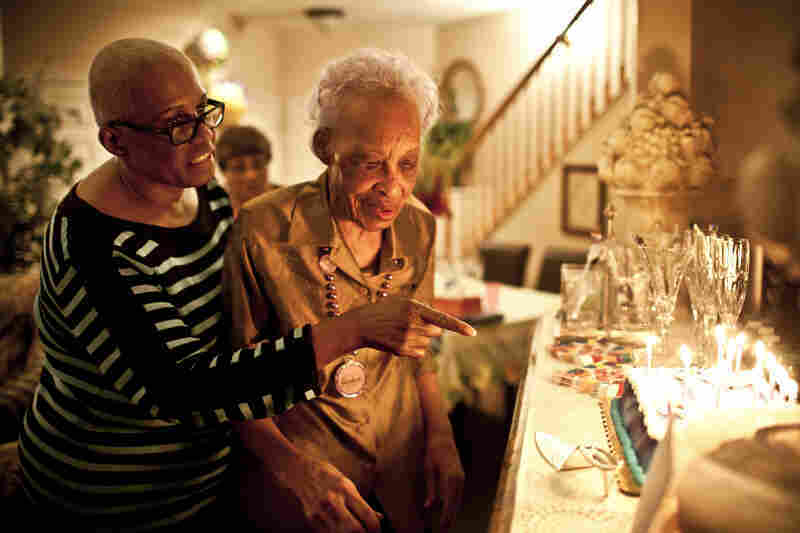 Geneva's daughter, Yolanda Hunter, quit her lucrative job to become Ida's full-time caregiver. "My daughter is a fantastic individual," Geneva says of Yolanda. "She said to me we are in this together ... and I don't know what I would have done without her." LaDonna Martin (left) shares full-time care of her grandmother-in-law, AnnaBelle Bowers, 87, with her sister-in-law, Kelley Hawkins. Both are nurses with two children each. AnnaBelle, who has limited mobility, moves every two weeks from one home to another. Kelley talks with AnnaBelle in her family room. Although caring for AnnaBelle is demanding, LaDonna says, "I grew up down South, and I think your family should stay with you. That's how I was raised ... but the expense is a big thing." 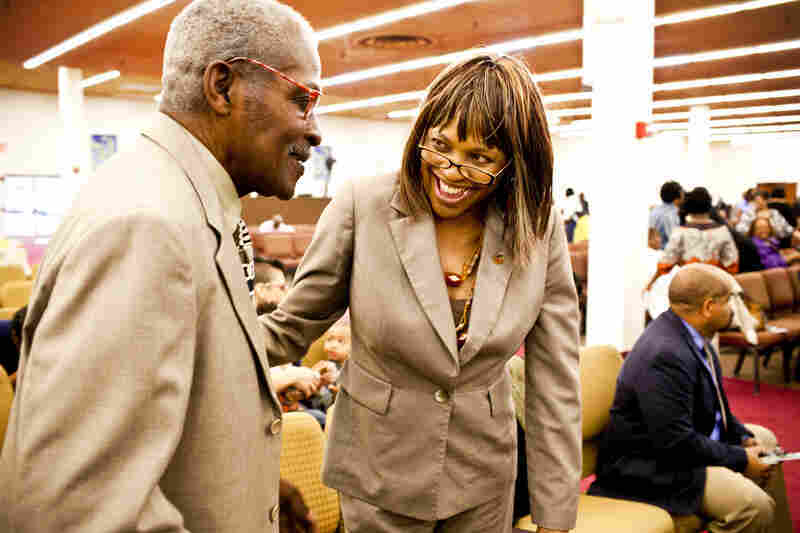 Natasha Shamone-Gilmore smiles at her father, Franklin Brunson, 81, during a Sunday church service in Capitol Heights, Md. She has taken on the daily challenge of caring for her father, who is suffering from mild dementia. 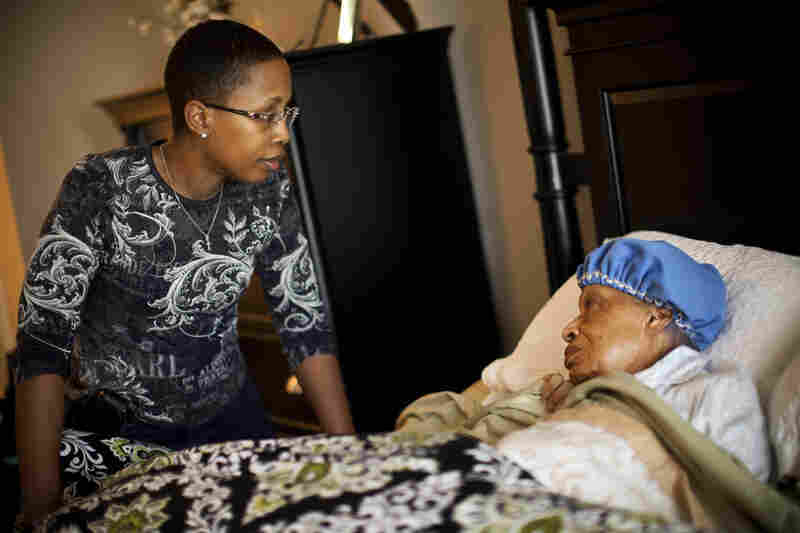 Along with caring for her aging father, Natasha keeps a close eye on her 80-year-old mother, Luella Brunson, who is often hospitalized with complications from chronic obstructive pulmonary disease. "The Lord has blessed us to make it all smooth," says Natasha, "but we are taking it day by day." Over the last two months, NPR's Morning Edition has been following three families who make up the growing number of multigenerational households in this country. All became multigenerational unexpectedly, when elderly relatives could no longer live independently and the families took them in. The finances, logistics and emotions can be overwhelming. NPR's David Greene brought caregivers from all three families together to share their experiences. Despite different income levels, not one of the three women said their families would put their parent, or in one case a grandparent, into a nursing home. "Eventually I will have to get a hospital bed," said Geneva Hunter, of Odenton, Md., when asked about her 89-year-old mother, Ida. "But I'm always thinking what to do to make her more comfortable for her. I think if she passed away today, I can look at myself and say that I did the best I could to make it comfortable for her, to give her a good life. She did her best for me, and I want to do the best for her." Earlier in our series, an expert from the Pew Research Center called multigenerational households an "unofficial anti-poverty program." Natasha Shamone-Gilmore, of Capitol Heights, Md., says the costs of living and education are forcing people to live together. Her 24-year-old son Nicholas lives with her and her husband, along with her 81-year-old dad. "My son wants a degree, but unfortunately when I was a young mom I didn't put aside a college fund," Shamone-Gilmore said. "But still, even if I tried to make a monthly payment plan I can't today because I have mom, dad and my brother as a financial responsibility." All three women say they would advise other families to save early, set up a college fund and establish good communication among family members. Still, while it's important to save for the future, there is something to be said for enjoying the present. LaDonna Martin is a mother of two young teens in Harrisburg, Pa., who cares for her husband's 87-year-old grandmother in her home. She says her husband has a different attitude because his mother died in her early 50s. "My husband ever since then he has been, like, 'Life is too short.' If he wants to go on vacation he wants to go. Not that we don't save, but you never know what tomorrow is going to bring."